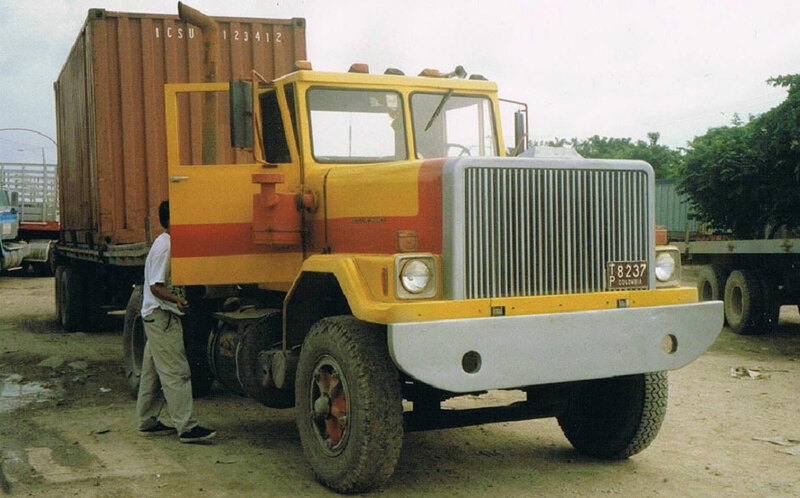 This truck was photographed in port Carthagena, Colombia. On both sides of the hood there is a small label that says "Motor Leyland". This is a Western Star. Judging from the cab and fenders, I'd say it's a mid seventies (possible foreign brand knock off) GMC general. The hood is wider than usual, perhaps larger radiator for warmer climate and rougher terrain. It is birtish made Leyland companie. Dudes, maybe, it's VW Constellation? International (in my opinion). Yes, it's very similari like a White, but White had a wider frame around the cooler grille. Не стоит искать среди крупных брендов ! Las luces son de un Chevrolet Super-Brigadier modelo 1990. La carrocería, el chasis y el motor podrian ser Leyland. El camión esta modificado. Tiene diferentes partes y piezas de diferentes camiones.rnФары Super-бригадный Chevrolet 1990 модельного.Кузова, шасси и двигателя может быть Leyland.Грузовик будет изменен. Оно имеет различные части и различных грузовиков.rnThe lights are a Super-Brigadier Chevrolet 1990 model. The body, chassis and engine could be Leyland. The truck is modified. It has different parts from different trucks. Сейчас этоrnhttp://www.chevrolet.com.cоrnВ свое время выпускали грузовики Austin отсюда видимо и движки Leyland.rnЕсть филиалы в Венесуэле и Эквадоре. Probably an ACLO (the name used by british AEC in South america), powered by a British Leyland engine. The AEC/ACLO was owned by Leyland and finished the production in 1979. On second thought it is probably a Leyland because it sais "Leyland" on the side most likely Leyland's attempt to sell in Columbia because if it were british, it would say "leyland motors" or something like that. Probably used for logging or off road uses. On the show Ax-Men on History channel one of the loggers uses this same type of truck.